In a previous article we calculated that an oil boiler in an average sub-urban house during an average winter evening will burn 1.48 Litres of oil per hour of operation, costing €1.20, at current prices. But what would it cost to heat the same house with the other available fuels? Below is a summary of average home heating fuel costs, with the cheapest first. Examining the costs, apart from using scrap timber in a stove, it would seem that wood pellets are the cheapest fuel to heat your home with. It is worth bearing in mind, however, that the set up costs are high. A modern auger fed wood pellet boiler with adjacent pellet store could cost as much as €12,000 to buy and install compared with approx. €2,750 for a modern high specification condensing oil boiler and tank. Grants are available for both from the SEI at present. 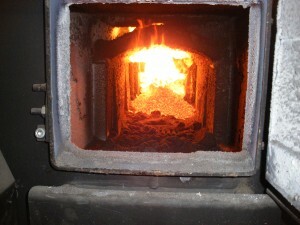 But the wood pellet boiler will be burning a sustainable fuel and over the longer term will be the cheapest option. I have assumed that the coal and briquettes will be burned in an enclosed stove with 80% efficiency and that the gas, oil, timber pellets fuels and electric storage heater (night) will have 90% efficiency. The electric heater (day) is assumed to be 100% efficient. There is a 30 min warm up time for the wood pellets before each use, which uses fuel, not included here. very useful information. Is using an open fire of coal and some wood, with a back boiler very inefficient? Would it be worth the cost of replacing the open fire with a stove?